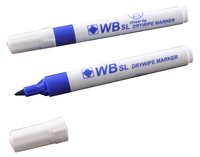 Whiteboard marker for a variety of uses. Chunky barrel for comfort grip. Strong plastic cap protects tip from damage. Chisel tip for variable line width Long-lasting reservoir. Approx Dimensions (CM): D15 W9 H3.8. Approx Weight (KG):0.1211.